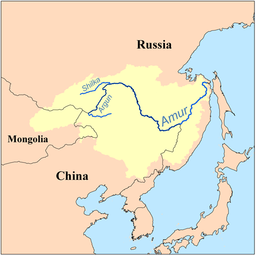 The Argun River, along 900 kilometers is the border between China and Russia and near Mohe, the most upnorth city in northern China, joins river Chika to form the Amur River (Heilongjiang in Chinese) which, for 1600 kilometers, materialize the border. The Evenki ( formerly known as Tungus and whose language is close to Manchu) in China are 30,000 people (35,000 in Russia). They constitute one of the 55 Chinese ethnic groups or nationalities. They come from the area between Lake Baikal and the Amur River and for centuries they have always lived with reindeer while other tribes raised horses. Contacts with Cossacks were difficult but the border between Russia and the Kangxi Empire was set in 1689 by the Treaty of Nertchinsk and later on the Evenki were incorporated into the eight banners of the Manchu Empire. 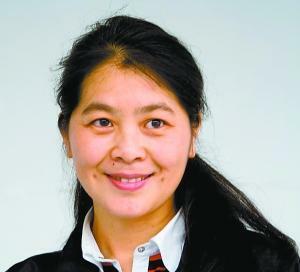 In an afterword unpublished but translated by Bruce Humes on his website Ethnic China Lit (www.bruce-humes.com), Chi Zijian explains that having spent the first 17 years of her life in the region of Mohe, she knew Orogen and Evenki tribes. The exploitation of the forest, which began in the 1960s, will imbalance the lifestyle of the Evenki and their reindeers; authorities will then attempt to settle them in Genhe-Inner Mongolia. 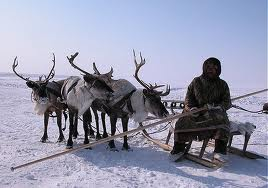 A trip to Australia and contacts with Aborigines in Darwin, will show her that the consequences of a sedentary lifestyle (alcoholism, prostitution, degeneration to tourist souvenirs of traditional art…) are comparable, but for the Evenki it is more serious because the reindeer cannot live penned like cattle. She returned to Inner Mongolia to investigate and meet older Evenki returning to their mountains and the younger generation who sees itself living in the city (2). The novel was published in 2006 and in 2008 is one of the three winners of the Mao Dun prize, the most prestigious literary award in China. The narrator, whose name is not known, is ninety years old and was married with two heads of Evenki clans. She tells us her life and that of her people. In the introduction to each of the four parts of the book, she speaks of what is today for the Evenki and of the impossibility for many to accept a sedentary lifestyle. The Evenki love their reindeer, they are much more than a herd, almost partners. “In my eyes, white reindeer are clouds fleeting across the face of the earth. I’ve never encountered another animal that possesses the docile temperament and endurance of the reindeer …Reindeer were certainly bestowed upon us by the Spirits, for without these creatures we would not be” (p.22). Men and reindeer accompany each other in migrations in search of moss for reindeer and new hunting grounds. They are free with their bells but return each evening at the camp. The Evenki do not eat their flesh, they drink their milk and use them to transport men and camps. Reindeer are a major obstacle to a more sedentary life. As the narrator says: “my reindeer have committed no crime and I don’t want to see them imprisonned either” (p.4). Reindeer like men have a king. The bells of the king who has just died, are attached to the neck of his successor, a small all white, chosen by the shaman (p.147). Like men, they are affected by epidemics at least as serious as the yellow fever which devastated the Evenki camps. Shamans could not protect, yet they know how to heal and can be go betweens with the spirits which are everywhere. Shamans, men and women, gradually discover their powers which are later recognized by the clan. Save lives has a price: a Japanese lieutenant Hoshida, requests to heal his leg injury, the shaman told him that it will cost him the life of his horse. The case of Nihau the Shaman is more tragic: “when she left the camp, she knew that if she saved the life of that sick child, she’d lose one of her own” (p.169). The forest is their life, their conical huts made of bark, wood and skins are easily transportable. The dead are buried “in the wind”, placed on platforms in the treetops. The trees must be respected, they are not cut indiscriminately. Birch bark is used to make most of everyday objects and canoes. The animals are hunted with respect, small like squirrels ( the skins are bartered) and pheasants, bigger like deers, and massive like bears and elks. Some can be tamed as Dashi’s hawk, his only friend hunting hares for him. Animals do not forget: a cub of which Dashi killed the mother finally found him after many years and killed him with his hawk (p.63). All characters in the book have a history; the diagram of the genealogy of the clan is the first page of the novel. Parentage of each member is essential, all have specific characteristics, their qualities and shortcomings. Hostilities and rivalries are mentioned and their consequences can be severe. The Evenki are not idealized but sometimes they can be reincarnated “Lajide grandfather realised that under a full moon, humans reveal their true colors. From their sleeping position you can tell what they were before-a reincarnated hare or lynx or tiger, and so on “(p.136). Love plays an important role in relationships, it is praised, glorified so as sexuality; women have a vital role even if some taboos still exist (they usually do not hunt and must not approach the blacksmiths “women are made of water and If they stand too close, they will put the fire out”(p.112). Some major events can reach the mountains of the Evenki: the Japanese occupation and the Manchukuo; the Japanese are not portrayed as devils as often is the case in Chinese novels. The opposition between Communists and KMT, the land reform, the famine of the Great Leap Forward, the Cultural Revolution and the Red Guards abuses, although these events create some serious problems, they do not change their lifestyle. It is the more and more intensive exploitation of the forest that is the breaking point. Roads, trains, severe fellings impact the vegetation and the mosses which the reindeer eat. Moreover game becomes very rare. And as from 1959 there is a policy to settle them (3) in several villages later on in Genhe (4). But the novel never turns to be a green pamphlet, it is a beautiful poem about life, people and nature. The style is simple, few lengthy descriptions but very lively dialogues. It is the life of her clan that the old lady tells us with her priorities and her own words. We are moved by this every day life without spectacular events, without major historical tragedies (like in “Survivors” by Wuhe, a great novel about the aborigines of Taiwan). The translator, Bruce Humes, has served well the writer. 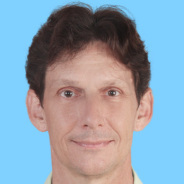 He has lived in China for a long time and in Kunming for the last few years. He is particularly interested in ethnic minorities as shown by the title of his blog. This novel was so definitely in his competence centers. He particularly looked for equivalences with words of the Evenki language which he has kept in some cases. His articles concerning the Evenki show his concern for these people whose civilization is disappearing. (1) Chi Zijian, “The last quarter of the moon”, translated by Bruce Humes. Harvill Secker. London 2013.